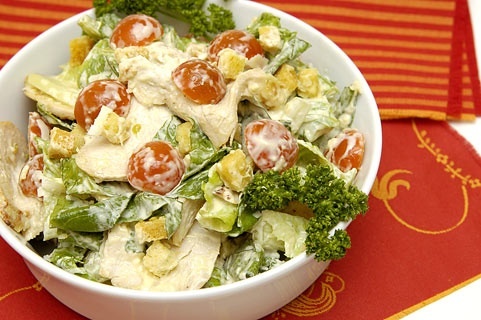 How to cook rolls "Caesar"
Salad "Caesar" is considered quite a food dish, however, it is not very difficult to cook at home. While maintaining its original taste, and by the time the whole process of cooking takes less than 40 minutes. Boil chicken breast and cut into squares (for those who like a more fatty foods, her pieces can be fried in olive oil until Golden brown). Cut into squares bell pepper halves and tomatoes. Add the vegetables to the chicken and mayonnaise to chicken breast soaked. The contents of the salad to squeeze two cloves of garlic. Separately grate the cheese on a coarse grater. Put the salad leaves in the mixture; add the croutons. To mix things up, greasing them with mayonnaise. Sprinkle the entire salad with grated cheese and add black pepper. Croutons and lettuce are recommended to pay before they serve the salad on the table. Then dress it with mayonnaise, otherwise the salad and the bread will get soggy, which can spoil the taste. Also, do not put too much mayonnaise, otherwise all the ingredients will be in it "float". The salad should be served immediately after making it. To save time, I recommend to use ready-made salad kit that you can buy in almost every store. Croutons you can make your own, fry the slices of white bread in the oven with salt. Or you can buy a ready-made pack of any white croutons with taste of cheese.